I realized the reason I couldn’t get these pictures out of my mind is because God was trying to say all along that this is what He’s been doing with me and is doing with so many of His people in the church. Back in November, I experienced some of the worst spiritual warfare and anxiety that I have ever been through. No doubt, I can attribute some of it to all the transition we have been through during the last two years. I’m not complaining because I wouldn’t trade one minute of it for anything. Tremendous blessings came during that time but I did struggle with understanding why I could be experiencing these thoughts and feelings when it should be the happiest time of my life. Being a new mom, working full time, being in full time ministry, trying to be a wife, step-mom, daughter, and friend, gets exhausting and I haven’t always taken the best care of myself through it all. People were disappointing me every time I turned around. I became frustrated and cried out to God many times for answers trying to understand what I am doing wrong or how to overcome this season I was in. I heard a lot of silence and didn’t always get the immediate response I asked for. I’m sharing all of this and becoming vulnerable because I believe most of us have been here on some level. I hope this is encouraging because the trial does end and joy does come. When the joy comes, our perspective tends to change about the people that let us down or the trial we went through. Everyone carries loads and burdens that others can’t even fathom and most of us have multiple roles that we play each day. The truth of God’s Word that He will never leave me nor forsake me sustained me through the hardest trial I have ever had to face as a Christian along with so many other scriptures that would take an incredible amount of time to list. My mind was racing and the enemy threw lie after lie at me until I felt like I was going to break because there was no rest. I won’t say that I’ve completely came out of this season of “roasting” or “crushing” but now I see the purpose. After the fire stops and the crushing ends, the beauty begins to emerge if we hold on to our faith and remain in Him who holds our hearts and minds in His hands. Fear and doubt have to go when we cast these anxieties on Him who cares for us. Paul prayed for the thorn in his flesh to be taken away and He didn’t get the answer he wanted but he was reminded that God’s grace would be sufficient and that His power would be made perfect in our weakness. It all sounds good and almost too easy to say but it’s true. We serve a mighty God who loves us when we feel beautiful and unstoppable but also when we feel weary and broken. Beauty comes after the crushing. Hold on. 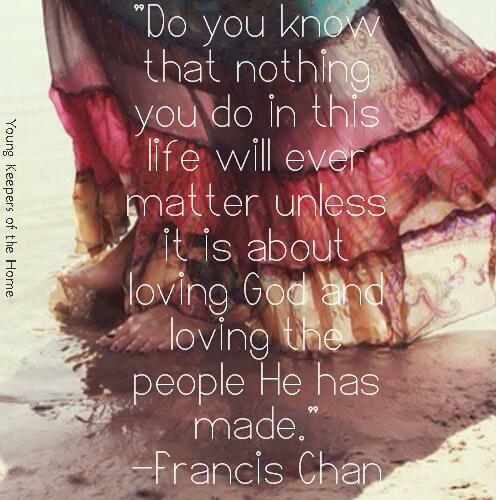 This quote from Francis Chan really spoke to me about the love of God and how it should inspire everything that we do. Nothing we do even matters if it is not motivated by love. Mike and I were talking yesterday about why we get so distracted by little things people do or say that don’t matter when we are really only called to love them. 1 John 4:7 says “Dear friends, let us love one another, for love comes from God. Everyone who loves has been born of God and knows God.” We can’t truly love until we are found in Him. It’s an area where I fall short many times because I realize how many opportunities I am given in a day to love. A couple weeks ago, a missionary from our church was able to go to India and share the gospel in an area where it is not necessarily welcome. He reported that many people gave their hearts to Christ during the trip. He was also able to preach the first Christian wedding in the city where a few hundred people heard the Gospel that day for the first time! The picture below is beautiful to me, seeing these women and men with their hands lifted high and praising the name of Jesus! To me, there are not many better expressions of love than people who are willing to be obedient and go where God leads them. That obedience could make the difference between someone choosing to accept His love or not. The link below allows you to sow into the ministry of missionaries like this who go to the uncomfortable places and engage with the lost. More pictures of this trip can be found at http://www.bcog.me/missions-photo-gallery/.